Common Core Explanatory/Informative writing chart. Great chart to use with Common Core writing. 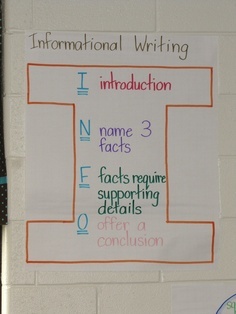 Students benefit from the structure provided through a simple chart. This can serve as a great resource for helping students learn what is required when writing to sources in order to meet shift number five of Common Core State Standards. Before you begin writing, think about a job you would like to do for pay. Now explain to the reader what job you could do to earn money. Back-to-school activity to get an idea who your students are and start the year on a good note. "What kind of teacher do you want?"